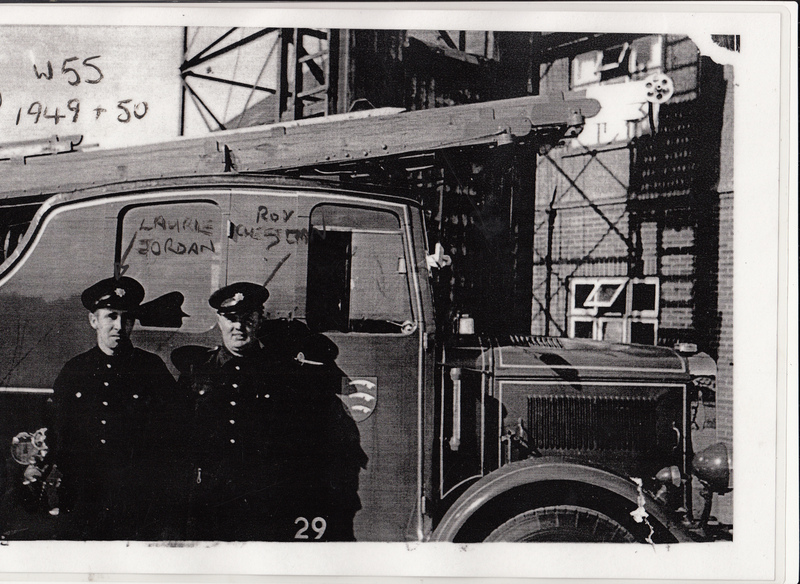 This photo shows Laurie Jordan and Roy Cheeseman at Tilbury Fire Station around 1949-50. Noted Paul’s comments and the Tilbury station opened in 1936 and was extended in 1966. In the early days it had fulltime and retain crews but the retained (part timers) were finished in 65. Not sure about the garage doors but you could well be correct in this. i remember the opening of the new fire station which must must have been in the late 1950s and I have in my mind the fact that, once completed,the doors to the station were not big enough for the engines to exit and hence they stayed in the yard. Does anyone remember this or is my memory complete nonsense?! I lived in a prefab next to the fire station garages so well remember the station. I knew the two people in the pictures and Laurie was my uncle, my mv mother’s brother and he married Vera Connor who was my father’s cousin, small world. Laurie was an elder brother to the window cleaner Roy Jordan who still lives in Arkwright Road, although now he is retired from work being in his 80’s.